Aura Kingdom Shinobi Guide is a summary, some knowledge and past experience of my own. As you may have already know, this is an over-powered class, with some guidelines and fine tuning, you will be able to solo the entire game. In this guide, I have covered a PvE build for Shinobi, specifically for Shinobi/Crusader. There is also a little coverage about sub-Bard and sub-Ranger, but sub-Crusader is focused mostly. There are more than one way to play a class. Everything here is personal experience and suggestion, feel free to agree/disagree. Different people have different playing styles, so this may or may not suit you. If you copy a build, you can only achieve just as good. To get even better results, you should tweak and test further! Be experimental! Think of this as a guideline, not rule. You don’t want to just copy-and-paste a character, you want an unique one. There is no “best” build, but rather a most suitable one. Alright, without further ado, let’s get started! 15 Wow! What was that! You subclass is unlocked at around level 40. Here are my suggestions on the picks, and comment on their skills. Also, recall that you are able to reset your subclass for free, with a cooldown of 10-minute. So be sure to try out different ones even if they are not mentioned here! Probably the most common and suitable subclass for Shinobi. Pick Crusader mostly for 2 skills: Dry Bones and Smiter’s Edge. Dry Bones: Make sure to use this skill with Divine Explosion, which adds effects of decreasing your target’s DEF. Click here to see the skill. Smiter’s Edge: Can be use with or without Divine Explosion depending on the situation. It’s usually charged when clearing mobs, and uncharged when fighting boss monster just to gain a DMG dealt +10% buff. Divine Sunderance: Gap-closer, useful when catching up and rushing in dungeon; has stun effect when charged. Ice Splitter: Can be cast without targeting, has AoE. Divine Thunderstrike: Useful when luring mobs. Sword Gaze: Party buff, increases CRIT DMG by 15% and CRIT. Mercy’s Wings: Has range straight-line AoE, you get a short period of location-lock after casting, so wouldn’t recommend it. Heaven’s Thunder: Has melee frontal AoE, can stun targets for 4 seconds. Blazing Dragon: Has range AoE, long casting animation. Bard works well as a subclass in general. Pick Bard mostly for 1 skill: Ballad. Ballad: Keep it active and stacked 3 times for the 12% Damage buff. Healing Harmony: Good heal but has a cast time. Ambient Drone: Can be cast without targeting, has AoE and has 3-second stun effect. Holy Notes: Instant heal, but it has long cooldown. Rhapsody: Party buff, increases Move SPD by 10%. Suitable for players who run with party frequently, it has the potential to deal higher damage output compared to sub-Crusader in a party. Pick Ranger mostly for 1 skill: Blessing of the Winds. Blessing of the Winds: Grants you 30% chance to hit twice, but it has long cooldown. Usually can be used twice in a dungeon run. Arrow of Light: Has frontal AoE, useful when luring mobs. Hail of Arrows: Has range Aoe, useful when luring mobs. Burst of Speed: Party buff, increases ACC by 5% and SPD. Sunfire Toss, increases DMG, lasts 10 seconds. Zeal, 10% chance to deal extra damage. Shadow Wind, decreases target’s DEF, lasts 10 seconds. Mostly used during solo run. Crippling Wind, increases target’s damage taken, stacks up to 6 times, lasts 8 seconds. Suitable during party run. Extreme Speed, increases EVA by 6% and Move SPD by 15%. Break Defense, 25% chance to decrease target’s DEF, lasts 8 seconds. The Best Defense, converts your DMG to DEF. Most common choice, it helps you out a lot if you are having a hard time capping DEF. Deep Blue, increases (Detailed) DMG and decreases Malice. Go for this one if you are satisfied with your DEF! It’s easier to first focus on equipment’s Secret Stones. Usually the weapon’s Secret Stones cost more. Of course, it may not be easy to roll, or cheap if you are to buy from other players. Just keep checking the market from time to time, and just use some similar ones temporarily. You can also buy other classes’ Secret Stones if you don’t care much about the bonus effects on your skills. Deals an extra 7% Damage to targets with the (element) attribute. Weapon’s Secret Stones will be mentioned in the later section. Azure Shuriken Storm Secret Stone, decreases your skill’s cooldown by 10%. Emerald Secret Stone Dragon Slayer, suitable for sub-Crusader, increases Dry Bones effect’s duration by 4 seconds. If you use another subclass, go for Crimson Blood Corruption Secret Stone or any other one as you see fit. There are Emerald Maple Star Secret Stone, increases your skill effect’s duration by 4 seconds; Crimson Maple Star Secret Stone, increases your skill’s DMG. However, I don’t use Maple Star in combat, so feel free to pick other ones. Azure Holy Notes Secret Stone, suitable for sub-Bard, decreases Holy Notes’ cooldown by 10%. There is no Secret Stone specified for Shinobi. Crimson Shadow Assault Secret Stone. However, this skill isn’t frequently used neither, so feel free to pick other ones. Secret tier Costumes offer All Stats +1%, that’s about as good as you can get. If you are in a budget, just buy the cheapest ones you find on the market! Any Hat Costumes with stats Max HP +2%. Any Face Costumes with stats DMG +2%. Any Costumes with stats DMG +2%. Any Ornament Costumes with stats DMG +2%. Any Weapon Costumes with stats DMG +2%. After you have bought your Costumes, it’s time to enchant them! Enchantment Card: Damage Against Bosses Mastery, increases your Damage bonus against Bosses by 10%. It will be used to enchant your Hat Costume. Premium Headgear Enchantment – HP, will be used to enchant the above Enchantment Card. If you can't afford Premium enchantment cards, go for Advanced ones for now! This applies to all Enchantment cards below. You can learn more information about Costume Enchantment Cards here! Enchantment Card: Shadow Assault Mastery, but since this skill isn’t frequently used, you can alternatively go for Enchantment Card: Evil Smiting Edge if you are sub-Crusader. It will be used to enchant your Face Costume. Click here to see Enchantment Card: Shadow Assault Mastery. Click here to see Enchantment Card: Evil Smiting Edge. Premium Facemask Enchantment – DMG, will be used to enchant the above Enchantment Card. Enchantment Card: CRIT Damage Against Bosses Mastery, increases your Crit Damage bonus against Bosses by 25%. 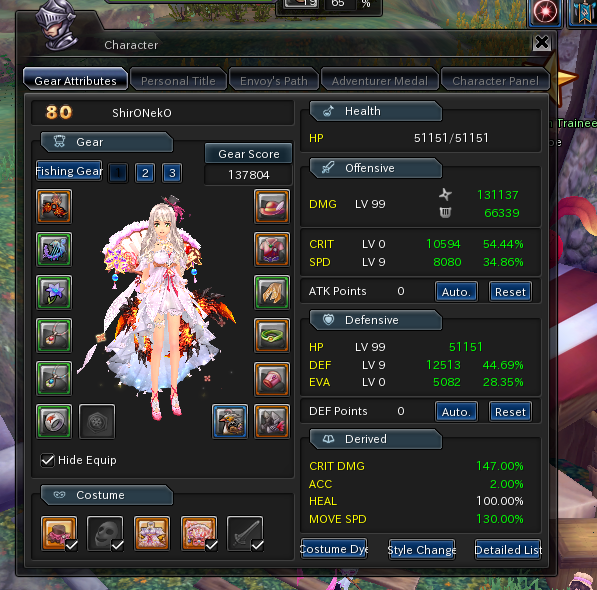 Premium Costume Enchantment – DMG, will be used to enchant the above Enchantment Card. Enchantment Card: Extreme Speed Mastery, increases your Move SPD by 5%. It will be used to enchant your Ornament Costume. Premium Back Accessory Enchantment – DMG, will be used to enchant the above Enchantment Card. Enchantment Card: Shuriken Toss Mastery, increases your skill’s level by 5. It will be used to enchant your Weapon Costume. Premium Weapon Enchantment – DMG, will be used to enchant the above Enchantment Card. His skill Emerald Gale stuns your target for 4 seconds. His skill Skillful Beads increases you and your party members’ DMG. All 3 Star Buffs give you Normal attack speed +25% and DMG +24%. Combo Skill High Pressure Front is Wind element, with DMG ×780% + Skill DMG ×780%, it’s not the highest, however. Her skill Evangelism increases you and your party members’ CRIT DMG by 20% and CRIT. All 3 Star Buffs can be rerolled to DMG +8% and DMG of Storm skills +45%, or other stats of your liking. Uzuriel’s Revelation enchant her attacks to have a 20% chance to decrease the target’s DEF by 5% for 10 seconds. Combo Skill Lightning Combo is Wind element, DMG ×900% + Skill DMG × 900%, highest you can get. Her skill Stormbolt stuns your target for 4 seconds. Her skill Inner Fortitude increases you and your party members’ DMG. Her skill Dazzling Blooms decreases your target’s DEF. All 3 Star Buffs give you Normal attack speed +25% and DMG +24%. Alternatively can be rerolled to DMG +8% and DMG of Storm skills +45% if you so choose. Yumikaze’s Satchel enchant her attacks to have a 20% chance to decrease the target’s DEF by 8% for 10 seconds. Combo Skill Deadly: Barbed Thunder is Wind element, with DMG ×600% + Skill DMG ×600%, it’s far from the highest, sadly. You can reach level 70 with ease by following along Main Quests and do Mirabelle’s Daily Quests. You main weapon would be Crimson Snake Dart, recipe can be brought from Blacksmith with gold. Use Destroyer Refined Targeting Core when crafting. Fortify as you see fit or need. Click here to see Crimson Snake Dart. Click here to see Destroyer Refined Targeting Core. Secondary weapon would be sufficient with a Nocturnal Relic tier bought from NPC. Alternatively craft it if you so wish, in that case use Nocturnal Core when crafting. If you can’t get those bonus stats or similar ones, you should at least make sure that DMG +2% is there! Lava Shuriken Toss Secret Stone would be the ideal choice. Alternatively, you can start off with Zephyr Shuriken Toss Secret Stone first. Click here to see Lava Shuriken Toss Secret Stone. Click here to see Zephyr Shuriken Toss Secret Stone. For your secondary weapon, use Lava Secret Stone as well. Prior level 70, you can use any equipment you received from completing quests, those coreless Secret tier equipment dropped from bosses are also helpful. If you have extra resources, feel free to craft level 70’s equipment, in that case go for Sniper Sets, recipes can be farmed, bought with 30K Dragon Points each or with gold from other players. Use either Imperial or Bestial Stalwart Refining Core when crafting. Click here to see Vengeful Sniper Set (Top). Click here to see Vengeful Sniper Set (Top) Bonus. Click here to see Ruthless Sniper Set (Bottom). Click here to see Ruthless Sniper Set (Bottom) Bonus. Click here to see an example of Imperial Stalwart Refining Core. Click here to see an example of Bestial Stalwart Refining Core. Craft level 60’s Malodnak’s Dark Claw and level 70’s Guzigla’s Bloodied Tooth, recipes can be farmed or bought with gold from other players. Click here to see Malodnak's Dark Claw. Click here to see Guzigla's Bloodied Tooth. Level 65 and 70’s Rare tier trophies are not considered. If you are planning on getting a Titan’s Flaming Soul, then might as well stick a bit longer with Malodnak’s Dark Claw. On the other hand, you can start spending to fortify Guzigla’s Bloodied Tooth, as we will be using it for a long time! That said, you should also craft it with Imperial Stalwart Trophy Refining Core; or Bestial Stalwart Trophy Refining Core if you so prefer, or if you are low on budget. Craft level 70’s Blinding Reflection Set, recipes can be farmed or bought with gold from other players. Imperial Guardian Accessory Core is good to use when crafting these if you can get your hands on one, but is not required. Click here to see Blinding Reflection Necklace. Click here to see Blinding Reflection Ring. Click here to see Blinding Reflection Shawl. Click here to see Blinding Reflection Set Bonus. Alternatively, if you are tight with the budget, you can also go for level 65’s Soaring King Set, they can be farmed, bought with 20.5K Dragon Points each or with gold from other players. The downside of choosing these is that you can not inlay Enchantment Cards. Click here to see Flokja's Gale Claw. Click here to see Flokja's Tornado Fang. Click here to see Flokja's Tempest Scale. Click here to see Soaring King Set Bonus. Pick whichever that is suitable for your economical situation. Enchantment Cards for equipment are only available for equipment that are level 70 and above. For weapon enchantment, go for Move SPD type. There are additional bonuses on these cards. If possible, go for Dual Drive; otherwise, use any one that you find or afford. Click here to see examples of Weapon Enchantment Card: Move SPD. For all 5 armor pieces and 3 accessories, go for DMG type. There are additional bonuses on these cards. If possible, go for pure DMG; otherwise, use any one that you find or can afford. Click here to see examples of Enchantment Card: DMG. Continue with your Main Quests and Mirabelle’s Daily Quests, and you will reach level 80 in no time. You main weapon would be Ghodroon’s Shaiya, recipe can be brought from Blacksmith with gold. Use Destroyer Flash Refining Core when crafting. Fortify to +21 and above. Click here to see Ghodroon's Shaiya. Click here to see Destroyer Flash Refining Core. Secondary weapon would be also crafted. Use Nocturnal Core when crafting. Craft Lordswrath Sets, recipes can be farmed, bought with 30K Golden Dragon Points each or with gold from other players. Use Imperial or Bestial Power Guardian Core when crafting. Fortify to +21 and above. Click here to see Scourge Set (Top). Click here to see Scourge Set (Top) Bonus. Click here to see Judgment Day Set (Bottom). Click here to see Judgment Day Set (Bottom) Bonus. Click here to see an example of Imperial Power Guardian Core. Click here to see an example of Bestial Power Guardian Core. Keep using level 70’s Guzigla’s Bloodied Tooth that you have crafted previously. Craft level 80’s Theory Time Travel Code, recipes can be farmed or bought with gold from other players. Use Imperial Power Guardian Creation Core when crafting. Fortify to +20 and above. Click here to see Theory Time Travel Code. Click here to see Imperial Power Guardian Creation Core. There are a few choices at this stage. If you are still using level 70’s set or below, I’d first and foremost recommend getting Fatal Toxin Set, they can be farmed, bought with 50K Dragon Points each or with gold from other players. Fortify to +20 and above. Fatal Toxin Set is basically an upgrade of Soaring King Set. Your SPD will be capped with ease. Shinobi Envoy’s Path gives you a lot of CRIT, so this will be a good fit without doubt! The downside of choosing these is that you can not inlay level 80’s Enchantment Cards. In addition, you lose an extra stats comparing to a crafted item. Click here to see Spider King's Fang. Click here to see Gainey's Gastrolith. Click here to see Nemeon's Cloak. Click here to see Fatal Toxin Set Bonus. If you still prefer crafting, then we have level 80’s Perfect War Set and Arcane Frost Set, recipes can be farmed or bought with gold from other players. If you can afford Perfect War then go for it, otherwise Arcane Frost will do as good. Use Imperial Power Guardian Accessory Core when crafting. Fortify to +20 and above. Given how much more expensive Perfect War is than Arcane Frost, the DMG stats can probably be neglected. So if you are tight with the budget, go for Arcane Frost. Click here to see Perfect War Necklace. Click here to see Perfect War Ring. Click here to see Perfect War Mantle. Click here to see Paragon of War Set Bonus. Click here to see Arcane Frost Pendant. Click here to see Arcane Frost Ring. Click here to see Arcane Frost Cloak. Click here to see Arcane Frost Set Bonus. Pick whichever that is suitable for your situation, the Fatal Toxin Set is what I’ve used mostly, but I did also have Arcane Frost Set. Envoy’s Path can be varied and customized based on your personal stats and the types of dungeons you run the most. Here I will list some paths that are must-take, along with some recommendations and suggestions, and feel free to tweak and experiment! A path marked with a white check indicates that it’s a must-take, a green check indicates that it’s recommended, and a blue check indicates that it’s okay to take if it fits your need. Unbound Rage: Must take for a total of 10% DMG dealt boost. Ninjutsu: Destruction: Must take for the massive CRIT boost and zeal proc. Razor Wind Mastery: Boost your main skill’s DMG and CRIT DMG, although its location is a bit off the main course, but still good to have. Pick them as you see fit. Shadow Symbiosis: Not a must, but is recommended in the beginning to help you generate Chakra, but you may not need it later. Skip this path if you don’t feel that much of a difference. Blur: Not a must, but if you have decent EVA then might as well get a free Move SPD boost while rushing dungeons. Skip this path if you are satisfied with your Move SPD. Blood Corruption Mastery: Suitable for players who use this skill frequently to recover their HP. The best ways of connecting them is something that you will have to try, test and find out. I will give a few examples below you can use for different situations. At level 75, you will gain 25 Envoy Points, which is the maximum amount and you won’t get more as you level higher. Click here to see Envoy's Path. Possibly discard Shadow Symbiosis and pick a third Combo Skill if you so choose. You can of course choose the Weak Point Analysis paths instead of Shinobi Studies ones if you wish to increase CRIT rather than CRIT DMG. Some players feel that the 2 paths for Greediness are wastes, in which case you will have to go through the Attack Swiftness paths. This is about the template I use for Vault of Eternity. Possibly discard Shadow Symbiosis and pick a second Combo Skill if you so choose. Distribute all ATK Points to DMG, and the leftover to SPD. Distribute all DEF Points to HP, and the leftover to DEF. Mastery Points can be spent based on your current stats, and depending on your Masteries’ levels, your Points may be limited in the beginning. I will give you a basic idea, and you can experiment and adjust to see what fit your current build the best. A mastery marked with a white check indicates that it’s a highly recommended, a green check indicates that it’s okay to take in general, and a blue check indicates that it can be helpful depending on the situation, e.g. the types of dungeons you frequently run and such. DMG and Move SPD are without a doubt must-takes. If you don’t have many Mastery Points yet, then spend them on the stats you lack. HP is always good to have it as high as possible. Between CRIT and SPD is mostly personal preference, if you are satisfied with your CRIT, then go for SPD. If you have maxed out both of your Masteries’ levels, then after choosing DMG and Move SPD, go for DMG to (element) targets. Most of time it’s the best to just use food and drink that have zeal proc if you are satisfied with other stats. Below are a few picks. Usually it’s Elemental Ascension, which increases SPD and CRIT. Depending on your pick of subclass, you might want to use other party buffs on other occasions. Click here to see an example of pet that increases 3 stats. There are various types of potions. They can increase stats, increase damage against certain elements, remove debuffs, increase Move SPD, Normal Attack SPD and so on. Craft as you can, or buy as you can afford! Click here to see some examples of potions. Fishing Rod and a whole (or parts of) Fishing Gear set will provide you additional stats. Different sets also increase different stats. Click here to see an example of Fishing Rod. Certain titles can increase certain stats, so try to earn as many as you can! Click here to see an example of Personal Title. A level 70 item dropped from monsters in high level dungeons, you can also buy them from other players. It increases Max HP and DMG by 1%, can be stacked up to 3 times, lasts 15 minutes. Only available on Tuesday, Thursday and Saturday. Basically it’s a buff you receive by distributing Moonlight Rice Cakes. It increases DMG, DEF and Move SPD by 3% when you turn in the quest, lasts 3 hours. A guide on getting the Moonlight Care buff can be found here! Potions exchanged from Valentin’s Event, no longer available. Buff item received from talking an NPC in Helonia Coast, no longer available. Fish caught from a School of Fish located in Helonia Coast, no longer available. When you choose the lowest difficulty. Solo Gaia's Sanctuary (5 Players) Heart of Darkness. Solo Gaia's Sanctuary (5 Players) Shores of Light. And with that it brings us to an end. Hopefully you got something useful out of this guide! As always, if you have any opinions, suggestions and ideas, feel free to share. Any feedback are more than welcome! And if you are to share this guide anywhere else, feel free to do so, linking to the original article is always appreciated as well! What should we get into the holy chest?? and, do you see viable instead of going for full max Hp going for 99%eva? Where envoy patch screens? Where all screens? You can create imgur for photo? It does seem a bit low. Try to increase your equipment’s star levels, they also increase your HP. Then also get a decent Gaia Emblem, and two other missing costumes as well! Thanks for this guide. A question about envoy path I was looking at someone’s path, why take Shinobi Mastery 1 (DMG+2% with shuriken) instead of Battle tactics 3 (DMG+4%)? Which Envoy’s Path are you referring to, there are 3 examples. if i got yumikaze *4 which 1 i should reroll for storm atribut dmg? I see! How about… my Crit? How can I cap it? Capping CRIT is rather easy for Shinobi. In general, level 80’s Perfect War Set and Arcane Frost Set both offer a lot of CRIT. In addition, Fatima’s Lightning Earring is also a good choice, I usually use it for Vault of Eternity. I forgot to mention this item in this guide, but I will add it in the next update! update for lvl 90+ please!! Hopefully you know, since everyone says something different, lolz. I’d probably just go for Dreamy Heaven, but I don’t play Ronin so.